A few months ago I ran across an intriguing recipe for Rattlesnake Sliders. The story behind them stuck with me and emerged in a brainstorm this past weekend. I was at the store and tried to remember as much as I could of the recipe for the filling. In the end, I wound up with something a little different, but the basic inspiration is still there. Thanks, Rebecca. 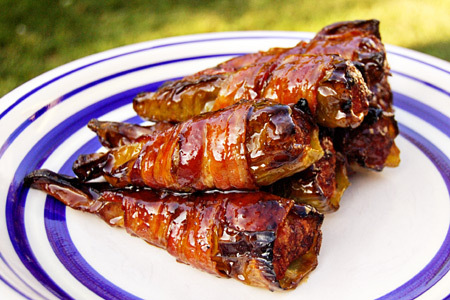 In short, these are Anaheim peppers stuffed with a combination of ground turkey and spicy pork sausage, wrapped in bacon, smoked, then glazed with a mixture of barbecue sauce, honey and butter. They are sticky sweet, with just a touch of spicy goodness. Wash the Anaheim chiles and cut the stem ends off so that they are of equal length. Cut a long V-shaped sliver out of one side of each chile. Start at the cut end, about 1/4" wide and end about an inch from the tip. The intention is to get them to open enough to seed, de-vein and stuff. Remove the seeds and veins from each chile. Mix all of the remaining ingredients, except the bacon, well in a large mixing bowl. Roll a tapered cylinder of the stuffing and fit it into the chile, packing it loosely from the tapered end up. You want it full, but not overflowing. Wrap each chile with one of the bacon slices. Starting about 1" from the cut end, tuck the end of the slice between the inside of the pepper and the stuffing. Stretch it around the pepper in a spiral pattern moving toward the other end (not overlapping). Tuck the other end in the tapered end of the chile, just as you started. It should leave you with about an inch of chile exposed at each end. Start your fire and prepare for indirect cooking over medium heat (about 300º). Add one small chunk of fruit wood (apple or cherry) to the fire about 10 minutes before adding the chiles. Wood chips soaked for 30-60 minutes will work well, too. If you're using a gas grill, make a smoker pouch. Dust each wrapped chile lightly with the seasoning. Cook the chiles indirect about 1 hour and 15 minutes, turning once at the halfway point. Mix the glaze ingredients in a small bowl. Glaze each chile on one side, turn, glaze the other side, and cook another 15 minutes. Glaze and turn the chiles again, then cook another 10 minutes. I just saw the photo of this on your site and it caught my attention. This looks awesome, I am going to have to give this a try!! Made these last night - they were excellent! any variations you'd do now with the glaze? Jeffrey - I'd probably add some Tiger Sauce. Advice request: Client wants peppers frozen and vacuum sealed. Should I glaze on smoker prior to freezing? Or, should I send along sauce for application while reheating peppers? Jeffrey - I'd definitely glaze them toward the end of reheating. Fern - I suppose you could bake/broil them, but they just won't be the same. Get yourself a little Weber Smokey Joe. I made them with chorizo and skipped the Tiger sauce, smoked them over apple wood and they were incredible! Thanks for sharing this awesome recipe! BTW, we served them with cilantro/lime rice, mango salsa and fresh tortillas. I have made these many times for friends and they say they are to die for!!! thank you ! I can't get tiger sauce here so I use Devils Spit in the meat and the glaze, works great! Joe - Thanks for your kind words. I'm really glad that you and your guests enjoy them.